Pizza is one of those recipes that you can get creative with. So is pasta. So if you want to get really creative, you combine the two together. And that’s exactly what I did for dinner last night. I wanted to create a recipe with ingredients that I had on hand. Earlier in the week I said I was going to make pizza again this week. Well I did…sort of. I didn’t have the time to make dough so I figured pasta would work perfectly in its place. And it did. This meal was delicious. I hope you enjoy this recipe! In a medium saute pan, saute onion and pepper in the olive oil until tender. In a small sauce pan, heat the pizza sauce. Stir in the cream cheese until melted. Combine the pizza sauce and cooked pasta and place in the bottom of a 1½ qt casserole dish. 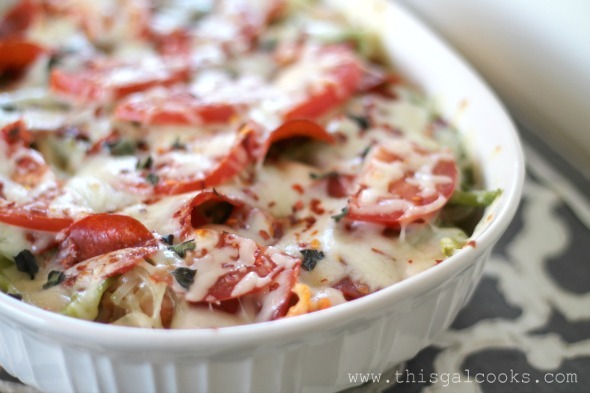 Layer with 1 C of the mozzarella cheese, then add the pepperoni, green peppers and onion in a layer. Add a layer of half of the remaining mozzarella cheese and top with the tomatoes. Layer on the rest of the mozzarella cheese and then sprinkle with fresh oregano and crushed red pepper. Turn on your broiler to high and place the pasta dish on the bottom rack of the oven. Allow to broil until the cheese is melted. I’m quite sure this would go well with my pineapple cocktail! Why do we have to live so far apart?! This looks absolutely amazing – pizza and pasta rolled into one. Definitely on my list of “must-makes”. Woo! That looks so so good! This sounds so good! I really like pizza pasta dishes!! 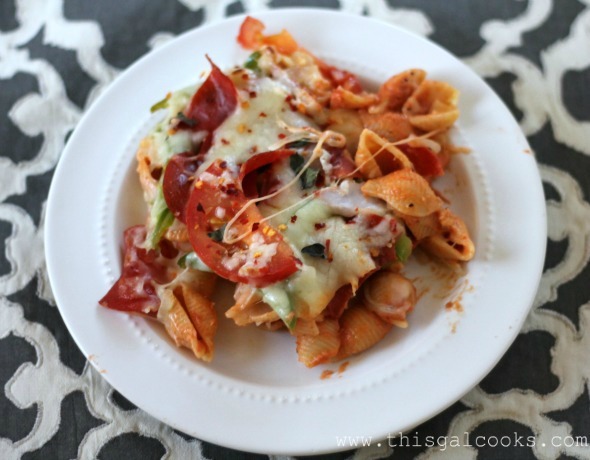 Julie, this looks delicious and I LOVE the pizza/pasta combo! I am making this for sure! Pinning! Have a great weekend. This looks great. Pizza is my absolute favorite! Usually my family doesn’t like casseroles, but this looks like one that might change their minds! Pinning it now!! I’ve made something similar to this before and I loved it…time to add it back to the rotation! Stopping by from SITS! Sounds DELISH! I’m gonna have to check out your other recipes. Glad you were featured today. Enjoy your SITS day! This looks good. I’m going to try it with quinoa or rice. Enjoy your SITS Day. I must try this! It’s all usually stuff that is in the pantry. Stopping by from SITS! oh man, this looks FABULOUS and would be a hit with both son and hubby. happy SITS day! This looks amazing, I can’t wait to try! Happy SITS day! This looks absolutely amazing! Visiting from SITS and I will most definitely be copy and pasting this. Both pizza and pasta are my husbands’ favorite foods. So combining them for him is pure genius! Thanks for the great idea! Oh boy that looks good with the added benefit that others in my household will eat it as well! Happy SITs day! Visiting from the SITS. This recipe looks delicious. I love pizza and pasta! Looking forward to trying it out! Wow, this looks delicious. Wonderful photos too. Stopped by from SITS. Enjoy your feature day! I think I just figured out what I am having for dinner tonight! Happy SITS Day Julie!!! Oh my gosh!! That looks delicious! My 6 year old would love this and so would I. Thanks for sharing. Enjoy your SITS Day! looks delish! i love the layout of your blog and posts, by the way. happy SITS day! This looks delicious! I have pinned it to refer to later :D Thank you for sharing! That looks amazing! Thanks for sharing, and happy SITS Day!! 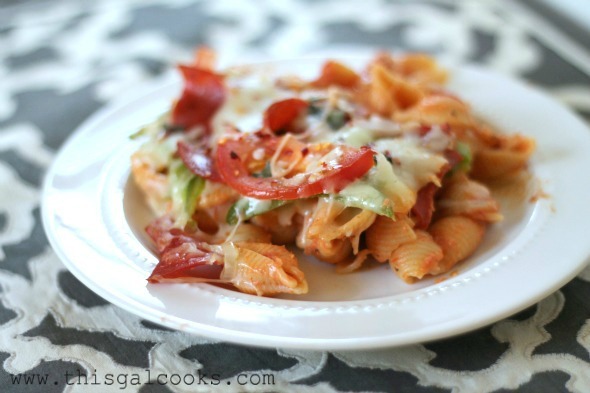 This looks AH-mazing…and I love that you used the seashell pasta! Great ideas here I cant wait to try! Thanks so much! This looks so yummy. Could I use red pepper instead of green? And how about whole wheat pasta? I love the turkey pepperoni idea. On my list to try! Happy SITS day! My husband would LOVE this! What a great recipe! Thanks for sharing. Visiting from SITS! Oh wow! I’m drooling now. Those are some beautiful photos. Happy SITS day. Oh wow, that looks amazing! Happy SITS day, late!